The Yankees and Blue Jays continue their season-opening four-game series with the third game later today. First pitch is scheduled for 4:07pm ET. In case you’re wondering, the minor league regular season begins this coming Thursday, so that’s cool. Anyway, here are some links and notes to hold you over until first pitch. 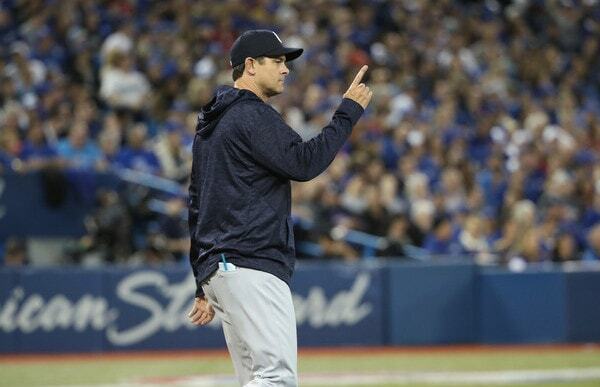 Prior to being named manager of the Yankees, Aaron Boone interviewed with the Twins for a front office job and the Cubs for a coaching position, reports Ken Davidoff. In the weeks after being hired, Boone admitted he was preparing to leave his ESPN gig to get back into the game, and hinted at interviewing with other clubs in addition to the Yankees. Now we know it was with the Twins and Cubs, for different roles. I know Boone kinda came out of nowhere as a managerial candidate — it sure surprised me when the Yankees interviewed him — nevermind as a managerial hire, but it sure seems like he’s highly regarded within the game. Multiple teams were interested in bringing Boone aboard in a rather significant capacity despite his lack of experience. Smart teams interested in adding smart personnel to their organization. News at eleven. The Yankees are targeting Tuesday, April 24th as a day to bring up a spot sixth starter, Boone told Billy Witz near the end of Spring Training. They’ll play the second game of a four-game series against the Twins at Yankee Stadium that evening. Boone and the Yankees have said they plan to use a spot sixth starter to give the regular starters extra rest from time to time. They’ve done that a whole bunch over the years. Nothing new here. Thanks to April off-days, the Yankees won’t need a starter to make a start on normal rest until Monday, April 16th, and even then only Luis Severino and Masahiro Tanaka would have start on normal rest. There’s an off-day on April 18th, giving the other three starters an extra day. Weather could always throw a wrench into things, but right now, whoever starts the third game of the season for Triple-A Scranton would line up for that April 24th start. My guess is Domingo German is atop the sixth starter depth chart the moment. A strong case could be made that the Yankees are better positioned than any team in baseball, because they have some of the best of all types of elements right now. They have a top farm system, including high-end infielders Gleyber Torres and Miguel Andujar; their major league team is loaded with young and old talent, from power-hitting outfielders Aaron Judge and Giancarlo Stanton to 24-year-old ace Luis Severino; and they have the greatest payroll flexibility of any Yankees team since the early 1990s — right before the Paul O’Neill-Tino Martinez dynasty. The Yankees’ biggest problem? Jacoby Ellsbury and his contract, according to the ESPN crew. And you know what? If Ellsbury and his contract are their biggest problem, that ain’t so bad at all. The big league roster is loaded, the farm system is loaded, the front office is shrewd as hell, and the Yankees have lots of money to spend. They’ll have even more to spend in the future, once they rest their luxury tax rate this season. Yep, the Yankees are in really great shape going forward. The Yankees have a great team and they were one game away from the World Series last season, so, not surprisingly, television ratings are up big time so far this year. The YES Network announced Grapefruit League ratings were up 80% from last year even though only one of their eleven spring broadcasts was in primetime. The spring ratings were better than March Madness ratings, on average. Furthermore, Opening Day was the YES Network’s highest rated season-opening broadcast in seven years, since the 2011 opener. The Opening Day broadcast drew more viewers in New York than all other sports broadcasts that day, including nationally televised NBA and MLB games on TNT and ESPN, respectively. The Yankees are good, they’re fun, and people are excited. I reckon attendance will be up quite a bit this year as well.